Emperor Constantine deeply revered the Sign of the Cross of Christ, and wanted to find the actual Cross upon which Christ was crucified. He sent his mother, Helen, to Jerusalem, providing her with a letter to St. Macarius, Patriarch of Jerusalem. Although Empress Helena was already in her declining years, she set about completing the task with enthusiasm. In searching for the Life-Creating Cross, she questioned both Christians and Jews, but her search remained unsuccessful. However, in 326, she was directed to an elderly Hebrew named Jude who told her that the Cross was buried at the pagan Temple of Venus. St. Helen ordered that the pagan temple be demolished. After praying, she began excavating the ground beneath the destroyed temple. Soon, the Tomb of Christ was uncovered, and not far from it were three crosses, a board with the inscription ordered by Pilate, and four nails which had pierced the Body of Christ. Legend has it that In order to determine the cross on which the Savior had been crucified, St. Macarius alternately touched the crosses to a corpse. When the dead man was touched by the True Cross of Christ, the body came to life. Having beheld the raising of the dead, everyone was convinced that the Life-Creating Cross was found. 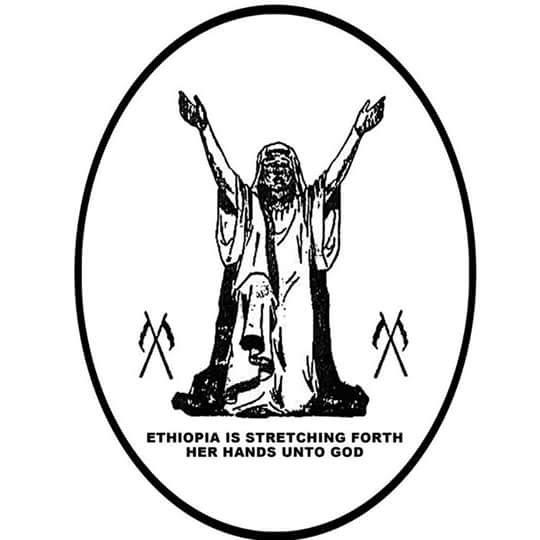 Because of her great service to the Church and her efforts in finding the Life-Creating Cross, Empress Helen is called “the Equal of the Apostles.” Ethiopian Orthodox, church tradition also records that the then Patriarch of Alexandria gave Ethiopian Emperor Dawit half of the cross in return for protecting Coptic Christians. 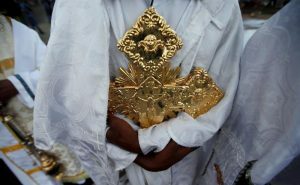 A fragment of the cross is believed to be held in Ethiopia’s Gishen Mariam monastery, about 100 km ( miles) north of the capital. 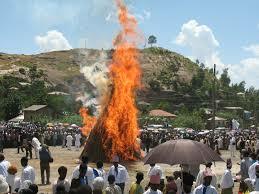 In Ethiopia, The Meskel celebration includes the burning of a large bonfire, or Demera, based on the belief that Queen Eleni, as she is known, had a revelation in a dream. She was told that she should make a bonfire and that the smoke would show her where the true cross was buried. So, she ordered the people of Jerusalem to bring wood and make a huge pile. After adding frankincense to it the bonfire was lit and the smoke rose high up to the sky and returned to the ground, exactly to the spot where the Cross had been buried. 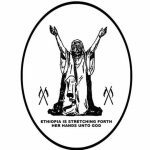 According to local traditions, this Demera-procession takes place in the early evening, the day before Meskel or on the day itself. The largest procession being in ‘Meskel Square’ in Ethiopia’s capital Addis Ababa, where tens of thousands of people, many holding up candles in the failing light as the sun set, crowd on terraces around the square where the ceremony is led by the head of Ethiopia’s Christian Orthodox church. The firewood is decorated with daisies prior to the celebration. Charcoal from the remains of the fire is afterwards collected and used by the faithful to mark their foreheads with the shape of a cross. Many believe that it “marks the ultimate act in the cancellation of sins, while others hold that the direction of the smoke and the final collapse of the heap indicate the course of future events. According to the Ethiopian Orthodox Church, the discovery of the True Cross is traditionally believed to have been in March, but Meskel was moved to September to avoid holding a festival during Lent, thus the church commemorating the True Cross in Jerusalem was dedicated during September.